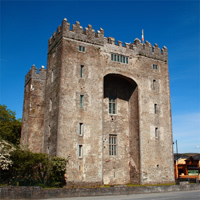 The site on which Bunratty Castle stands was in origin a Viking trading camp in 970 A.D. The present structure is the last of four castles to be built on the site. Robert De Muscegros, a Norman, built the first defensive fortress (an earthen mound with a strong wooden tower on top) in 1250. His lands were later granted to Thomas De Clare who built the first stone castle on the site. 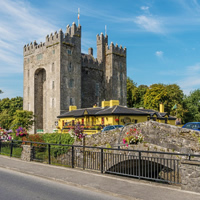 About this time Bunratty became a large town of 1,000 inhabitants. The powerful MacNamara family built the present structure around 1425 but by 1475 it had became the stronghold of the O`Briens, the largest clan in North Munster. They ruled the territory of North Munster and lived in great splendor. The castle was surrounded by beautiful gardens and it was reputed to have a herd of 3,000 deer. 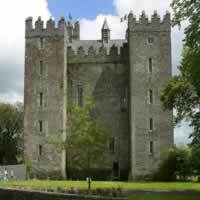 Bunratty Castle and its lands were granted to various Plantation families, the last of whom was the Studdart family. They left the castle in 1804 (allowing it to fall into disrepair), to reside In the more comfortable and modern Bunratty House, which is open to the public in the grounds of the Folk Park. Bunratty returned to its former splendor when Viscount Lord Gort purchased it in 1954. The extensive restoration work began in 1945. It was then opened to the public in 1962 as a National Monument and is open to visitors year round. It is the most complete and authentically restored and furnished castle in Ireland. The Castle is furnished with mainly 15th and 16th century furnishings. 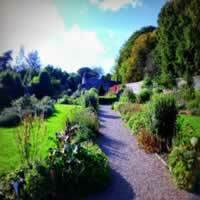 Bunratty Folk Park, located in the grounds of Bunratty Castle is Ireland`s premier attraction. 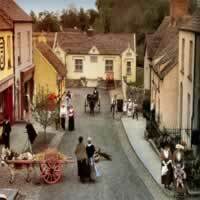 Bunratty Folk Park recreates rural and urban life in 19th century Ireland. It is a living reconstruction of the homes and environment of Ireland of over a century ago. Set on 26 acres, the impressive park features over 30 buildings in a `living` village and rural setting. Rural farmhouses, village shops and streets are recreated and furnished as they would have appeared at that time according to their social standing, from the poorest one roomed dwelling to Bunratty House a fine example of a Georgian residence for the gentry built 1804 home of the Studdarts, the last family to occupy Bunratty Castle. The village houses and shops in the Folk Park have been chosen from many different areas, to form a collection of typical 19th century urban Irish buildings including the School, Doctor`s house, Pawnbrokers, Pub, Drapery, Printworks, Grocery, Hardware shop, Pottery and a Post Office. Costumed characters recreate the traditions and lifestyle of a bygone age and animate the Folk Park. Among these well known and loved characters are the Bean a Ti (woman of the house), RIC (Royal Irish Constabulary) policeman, Schoolteacher. Traditional jobs and crafts are also represented, milling, the forge, pottery, printing, baking, farming etc. The beautiful walled garden at Bunratty House is a surviving part of the demesne which was originally formed around Bunratty Castle. The garden was built for the house circa 1804. As walled gardens go it is small because a large garden would have existed within the demesne, located north of the castle. This large garden would have functioned as a kitchen garden for Bunratty House and therefore it was unnecessary to have another large production garden. The garden was built on the east side of the house and beyond the stables protected from the prevailing westerly winds. It is enclosed by four original stone walls forming an irregular space. Apart from the walls, no original features remain except for a disused entrance to the south wall near the house, which would have been used by the family and a cart entrance near the south east corner, with original Iron Gates. Views from the garden to the east overlook the reclaimed salt marshes of the Owengarney River Valley and to the south toward the River Shannon Estuary.